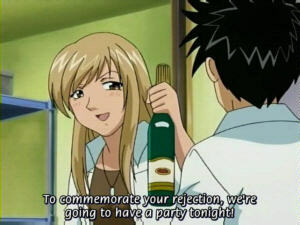 Pic of the day: "To commemorate your rejection, we're going to have a party tonight!" That's the kind of logic I like. The novel is dead, long live the novel! I gave up on my NaNoWriMo novel. So what did I do next? Start a new NaNoWriMo novel! Instead of romance, I chose light fantasy. The truth is that this is where my talent lies, and the lighter and more fantastic the better. No matter what happens, I can never be the next Barbara Cartland. I could however be a new Piers Anthony ... only without the naked children checking each other out. The new story started as simply three words, the title of the story. "In Hoc Signo" (in this sign). That and a vague memory of what I said three years ago (although I did not know it was exactly three years ago until I read the entry later), that perhaps I should write a paladin story. Well, it isn't exactly a paladin story, but that was the vague idea when I started. Rather than just any paladin, Vincent is The Chosen One. In the old MS-DOS game Master of Magic, players who choose to concentrate fully on White magic get a spell to summon the Chosen One, an avatar of white magic. He is like a super paladin, immune to magic (but unable to cast ranged attack spells as well) and protected from evil. He also has a strong positive effect on troops stacked with him. This, it turns out, is pretty similar to the Champion concept in this story. That's fine by me, I loved that game, although I can't play it on modern machines. Even under Windows 98 it usually crashes partway through, and reloading will just cause it to crash again at the exact same place. Anyway, weird as this may sound, it is much easier to write when I have no plot, not even the faintest idea of what comes next. I just sit down and begin to write, and the story pours up from my subconscious like a geysir. While I get some glimpses ahead, they are few and not far ahead. For the most part I learn the story as I write it. Ironically it is this type of writing Margit Sandemo does, the Scandinavian queen of supernatural romance. It is largely because of her that I have tried to write that genre. She just starts writing, and writes it through from beginning to end. She edits nothing except spelling errors. So it is not Shakespeare or Ibsen, but it sells like hotcakes, and better yet she has churned out well over 100 books in her lifetime. While they have much together, they are certainly not the same book with different names either. So perhaps the only way I can become the next Sandemo is by becoming the next Piers Anthony. "To thine own self be true", indeed.